19And when the LORD saw it, he abhorred them, because of the provoking of his sons, and of his daughters.20And he said, I will hide my face from them, I will see what their end shall be: for they are a very froward generation, children in whom is no faith.21They have moved me to jealousy with that which is not God; they have provoked me to anger with their vanities: and I will move them to jealousy with those which are not a people; I will provoke them to anger with a foolish nation.22For a fire is kindled in mine anger, and shall burn unto the lowest hell, and shall consume the earth with her increase, and set on fire the foundations of the mountains.23I will heap mischiefs upon them; I will spend mine arrows upon them.24They shall be burnt with hunger, and devoured with burning heat, and with bitter destruction: I will also send the teeth of beasts upon them, with the poison of serpents of the dust.25The sword without, and terror within, shall destroy both the young man and the virgin, the suckling also with the man of gray hairs.26I said, I would scatter them into corners, I would make the remembrance of them to cease from among men:27Were it not that I feared the wrath of the enemy, lest their adversaries should behave themselves strangely, and lest they should say, Our hand is high, and the LORD hath not done all this.28For they are a nation void of counsel, neither is there any understanding in them.29O that they were wise, that they understood this, that they would consider their latter end!30How should one chase a thousand, and two put ten thousand to flight, except their Rock had sold them, and the LORD had shut them up?31For their rock is not as our Rock, even our enemies themselves being judges.32For their vine is of the vine of Sodom, and of the fields of Gomorrah: their grapes are grapes of gall, their clusters are bitter:33Their wine is the poison of dragons, and the cruel venom of asps.34Is not this laid up in store with me, and sealed up among my treasures?35To me belongeth vengeance, and recompense; their foot shall slide in due time: for the day of their calamity is at hand, and the things that shall come upon them make haste.36For the LORD shall judge his people, and repent himself for his servants, when he seeth that their power is gone, and there is none shut up, or left.37And he shall say, Where are their gods, their rock in whom they trusted,38Which did eat the fat of their sacrifices, and drank the wine of their drink offerings? let them rise up and help you, and be your protection.39See now that I, even I, am he, and there is no god with me: I kill, and I make alive; I wound, and I heal: neither is there any that can deliver out of my hand.40For I lift up my hand to heaven, and say, I live for ever.41If I whet my glittering sword, and mine hand take hold on judgment; I will render vengeance to mine enemies, and will reward them that hate me.42I will make mine arrows drunk with blood, and my sword shall devour flesh; and that with the blood of the slain and of the captives, from the beginning of revenges upon the enemy.43Rejoice, O ye nations, with his people: for he will avenge the blood of his servants, and will render vengeance to his adversaries, and will be merciful unto his land, and to his people.44And Moses came and spake all the words of this song in the ears of the people, he, and Hoshea the son of Nun.45And Moses made an end of speaking all these words to all Israel:46And he said unto them, Set your hearts unto all the words which I testify among you this day, which ye shall command your children to observe to do, all the words of this law.47For it is not a vain thing for you; because it is your life: and through this thing ye shall prolong your days in the land, whither ye go over Jordan to possess it.48And the LORD spake unto Moses that selfsame day, saying,49Get thee up into this mountain Abarim, unto mount Nebo, which is in the land of Moab, that is over against Jericho; and behold the land of Canaan, which I give unto the children of Israel for a possession:50And die in the mount whither thou goest up, and be gathered unto thy people; as Aaron thy brother died in mount Hor, and was gathered unto his people:51Because ye trespassed against me among the children of Israel at the waters of Meribah-Kadesh, in the wilderness of Zin; because ye sanctified me not in the midst of the children of Israel.52Yet thou shalt see the land before thee; but thou shalt not go thither unto the land which I give the children of Israel. 11And the Pharisees came forth, and began to question with him, seeking of him a sign from heaven, tempting him.12And he sighed deeply in his spirit, and saith, Why doth this generation seek after a sign? verily I say unto you, There shall no sign be given unto this generation.13And he left them, and entering into the ship again departed to the other side.14Now the disciples had forgotten to take bread, neither had they in the ship with them more than one loaf.15And he charged them, saying, Take heed, beware of the leaven of the Pharisees, and of the leaven of Herod.16And they reasoned among themselves, saying, It is because we have no bread.17And when Jesus knew it, he saith unto them, Why reason ye, because ye have no bread? perceive ye not yet, neither understand? have ye your heart yet hardened?18Having eyes, see ye not? and having ears, hear ye not? and do ye not remember?19When I brake the five loaves among five thousand, how many baskets full of fragments took ye up? They say unto him, Twelve.20And when the seven among four thousand, how many baskets full of fragments took ye up? And they said, Seven.21And he said unto them, How is it that ye do not understand? 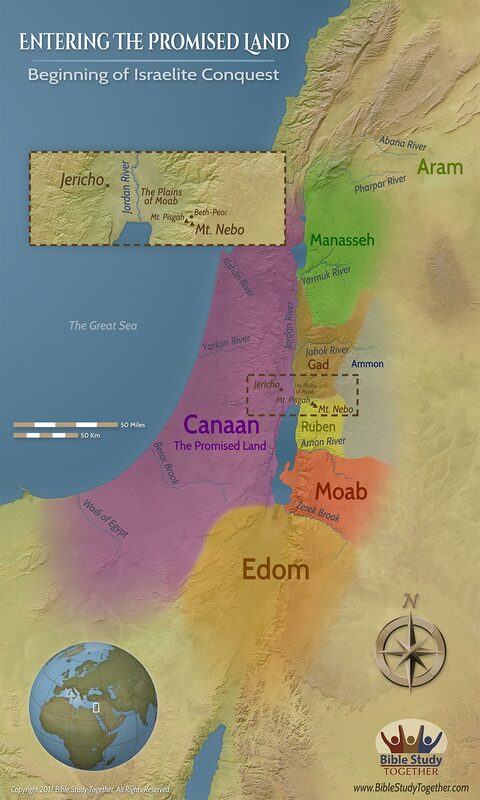 What was going to happen to the Israelites when they rebelled? What made Moses’s words life to the people? How important is it for us to treat God as holy in the midst of His people? How have you failed to see that God can provide for you like the disciples? Remember with someone how God has provided for you.